The 2013 Pulsed Power and Plasma Science Conference is the place for you to be next June! We’d love to chat with you about your booth. The Exhibitor's Kit is available right now (as a pdf file) by pressing this link. You can also view our customized Exhibitor's Kit by pressing this link! Reserve your booth at PPPS-2013 now! 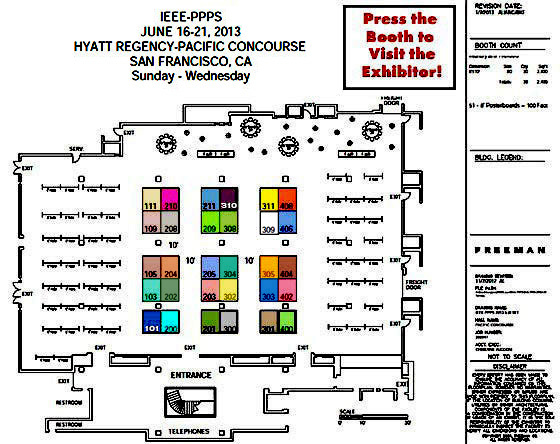 Reserve a Booth at PPPS-2013! Booth Cost: $4500 with a limit of one booth per exhibitor. Booth Availability: Booths are reserved on a first-come, first-served basis. An exhibitor kit with all of the information including additional services is available here.